Mother Mary and Mary Magdalene have been with me as spiritual guides for a long time now and lately, Mother Mary has been coming to me in unexpected places. I bought two statues of Mary that caught my eye at a couple of vintage stores I recently stopped into. One is of her face, which I am decoupaging, and the other is a full figure with chipped paint and a little angel peeking out from beneath her robes. The two Marys came to me again recently after my annual exam since having thyroid cancer and my thyroid removed in 1997. A lymph node lit up on a PET scan in my lung area. I called in the two Marys, who had helped me though my healing process before, and after 3 months of probing and questioning by doctors and talk of removing it, the lymph node disappeared without medical intervention. Through this, I was reminded of the healing power of these two goddesses once more. They have guided me through some dark times. I'm feeling the need for Mary's protection and guidance now as I step into somewhat new territory of leading goddess workshops based on the goddesses in my workbook. I am feeling a bit tender and vulnerable and even a little overwhelmed as I prepare for this new leadership role. It is times like these that I seem to need her most. I think there is a part of me that has resisted the mother, Mary, because of the way she has been sanctified and even made a bit saccharine in Christian tradition, so I have been trying to meet her--the Christian version of her--and see her in her full depth and meaning. I find her more approachable and accessible in her old, chthonic forms. I've found that her spirit lives in every culture, going back to the images of the Great Mother from Neolithic and Paleolithic times. In the round, full-figured Venuses that have been dug up throughout Europe and Asia. 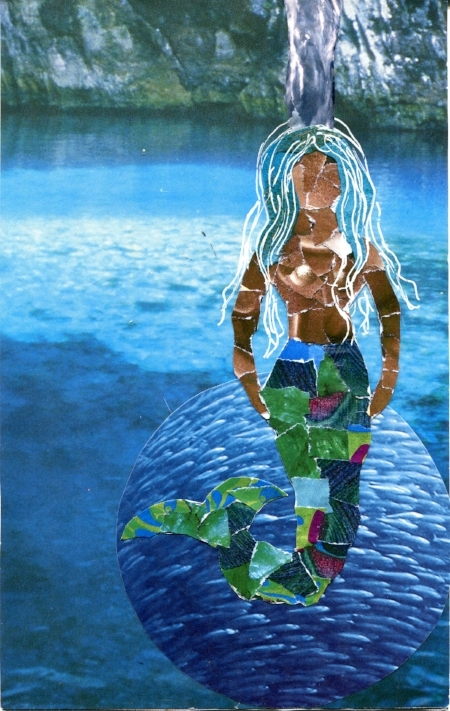 She is Stella Maris, mother of the sea, personified as Yemaya in West Africa. 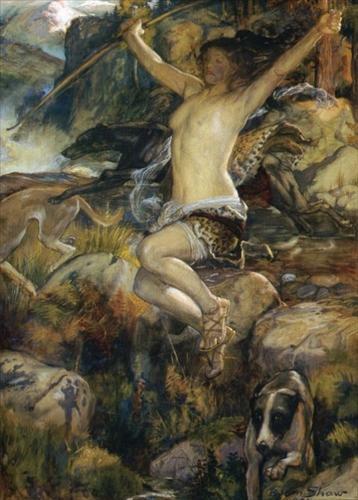 She is Artemis of Ephesus, the ancient many-breasted goddess before she became the Greek goddess of the forest and its creatures. 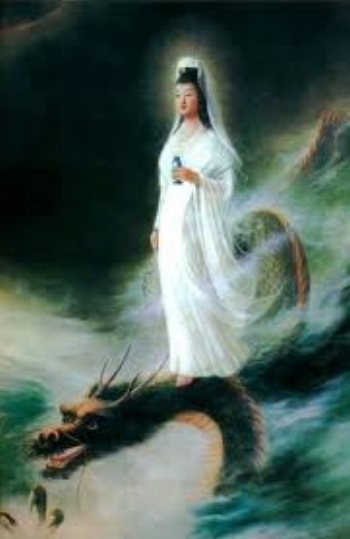 She is Kwan Yin, the Buddhist goddess of mercy. She is Brigid, the Celtic earth goddess. She is Isis, the Egyptian goddess who gives birth to a divine child. She is even Kali Ma, the blue-faced Hindu mother goddess. All of these goddesses are considered midwives who watch over women during childbirth, where life and death hover at the crossroads. The Christian mother of God could be said to be one of the later incarnations of this powerful, earthy archetype. Except, in Christian tradition her earthiness and sexuality were split off and given to the other Mary, of Magdalene. Both she and Lilith, goddess of Jewish tradition, were cast in the role of prostitute by Judeo-Christian patriarchy because in that dualistic worldview, the feminine was not to be sexual unless she was "bad." Only the feminine divorced from her earthiness, fecundity and sexuality, was "good." That put women in quite a bind. This is also why I have struggled with Mother Mary, a supposed virgin mother. She represents only part of the feminine whole, an exalted part, an idealized version that is hard, if not impossible, to reach. Only by embracing the two Marys have I felt that there is completion and a mirror in which I can see myself. Mary Magdalene, the human Mary, carries the energy of the error-prone, often misunderstood wife/mother, who must find her way in the world. Only recently has the Catholic Church admitted that there is no evidence she was a prostitute and allowed that she was, in fact, a disciple, although many believe she was more than that. They're not ready to admit that she may have been the wife of Jesus and the mother of their child, Sarah, a girl -- what was cryptically referred to as the Holy Grail -- a cup, a feminine holder of Wisdom, the missing part to the masculine divinity that took hold and has prevailed ever since. In many ways, we're still searching for the Holy Grail, the feminine divine. Mother Mary comes to me, perhaps asking to be understood, accepted, allowed in, as she is. After all, she has survived the patriarchal attempts to mute and transform her. Now when I look at her I can't help but see the hidden layers, knowing there is a deep, dark goddess at her heart, a timeless being that cannot be thwarted. 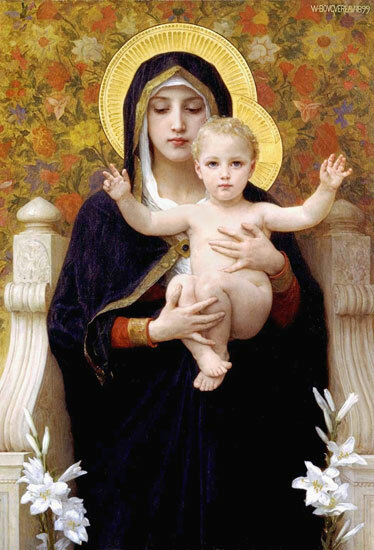 There is no question that the Madonna and child is beautiful in art, but in most paintings I find her remote. I am drawn to the black Madonna, which seems to hold more of her down-to-earth nature: dark, black, warm, moist, like the soil. On my altar, I have both the light and the dark Mary to remind me of the riches to be found in both places, above and below, in the shadow and in the light, in the labor of birth and in the release of death, in her humanness and in her glory. Symbolically, we are giving birth over and over again as we create every new permutation of our lives. And, so, too, are we dying many little deaths throughout the spiral dance of life. We need our mother, the Great Mother, to see us through these often cataclysmic changes. I have found that when working with the energy of whatever goddess is making herself known, it is important to bring her into the world, to find or create images, symbols, and totems to see and touch, to work with on a daily basis. It is through images and symbols that we can create a dialog with our soul, and thus find the deeper meaning of our existence. I am loved and I am scorned. I am life, I am death. I am pure and I am soiled. that hides within all questions. and all that is outside you. the secret shape of your soul. A springtime goddess in the Hopi tradition, she flutters into our hearts to remind us to taste life--butterflies taste flowers by walking on them--and to connect with nature. Butterfly Maiden is a kachina spirit of fertility and spiritual growth. Kachinas carry the prayers of the people to the ancestors in the spirit world. For the Hopis, the butterfly is a symbol of everlasting life and joy. This maiden spirit helps us open our heart chakra of love and compassion, not only for others, but for ourselves. As I await word about whether or not I have a tumor in my chest, I am sending love and light to this area. I go to the doctor on the 5th to find out more. It's something that has shown up on scans since 2003, so logic, as well as my heart, tells me it's not cancer. But it may need to come out. I have pictured a moth, beating its wings against my chest cavity, trying to find its way out of this darkness so it can fly towards the light--blue healing light and freedom. I have been going through a different sort of metamorphosis, having completed my Soul Work book, In the Lap of the Goddess: Connecting With the Divine Feminine. It will be available for download and in printed form I hope with my next post. That is when the lovely Goddess Leonie will be showing up to tell us about the harbinger of Ostara, her own beautiful, tiny goddess named after the feminine deity of Easter. Stay tuned! Embarking on a creative journey brings up a lot of fear and resistance in me. First I am bubbling and bursting with ideas, and then I start to create and manifest them, and then often I find the downpour becomes a drizzle until it fizzles out, another project not completed. So I have been working with a creative coach who is helping me dig down and connect with my Conscious Core, find my blocks and limiting beliefs, and turn them around. I am finding this takes a lot of practice and discipline. As my teacher, Laurece, reminds me, my ego wants to keep me doing what its always done, traipsing down the same neural pathways, while my soul is striving to clear decades-old beliefs. And as Eckhart Tolle says, "the more you make your thoughts (beliefs) into your identity, the more cut off you are from the spiritual dimension within yourself." I also like what Seena B. Frost says in an interview with Catherine Anderson, on her blog, Listening for the Whisperings. When talking about the right brain process of selecting images (or letting the images select you) when doing SoulCollage®, she says, "Images are sneaky! Somehow they can sneak around our ego defense system better than words can. Imagine this: all your ego parts (those Neters that want to keep the status quo,) are standing arm in arm around the entrance to your unconscious. They will allow no trouble or surprise or change to come up from down there where your half-formed juicy parts are churning around, eager to leap out and manifest into form. "These energies may have been sent below because when you were a child, they were too out of line. Or they may be energies that never were allowed to emerge, to be named and recognized because they were judged, by ego Neters, to have too much Shadow. However these are energies that Jung would call our ‘hidden gold’, despite their Shadow. Also down there are the Archetypal Energies that guide our Souls, urging us towards certain life paths. They may be unrecognized thus far, and their guidance so strange and powerful that we fear and resist their urgings." Thus the age-old struggle of the artist to emerge is a difficult birth when confronted with the power of the ego. I realize I needed help in this birthing process and I think of my coach, Laurece, as my mid-wife. I have been creating a goddess book, a way to journey and connect with the divine feminine in her many forms. But first I am finding I need to play with these goddesses and emerging energies myself, and find their power through living with them, dialoging with them, and learning from them. Yemaya is a creator goddess who has been with me for much of 2010. She is a watery sea goddess who is helping me create flow -- of energy, of creativity, of ideas and a sense of ease and playfulness as I manifest my dreams. I have long known that the whale is my totem animal that I came in with. I know this because I had a magical experience when I was 5 years old and living in California. My parents took me out on the ocean for a whale-watching tour and as everyone's eyes were focused on one side of the boat, I saw a whale rise from the water on the other side of the boat. It was as if she wanted me to know she saw me and recognized me. I looked directly into her large, soulful eye and for a moment was held in a suspended moment of magic, knowing I was experiencing something numinous. Before I could exclaim what I'd seen to the others on board, she disappeared from sight. Everyone pointed and shouted when they saw her tail flip up as she swam away, but I could only stand quietly in awe at what I, alone, had been privileged to experience just moments before. I consider her one of my spirit guides. A sister spirit of the whale, the manatee, is the guardian of my sacral chakra, the center of creativity, feeling, sexuality and sensuality. 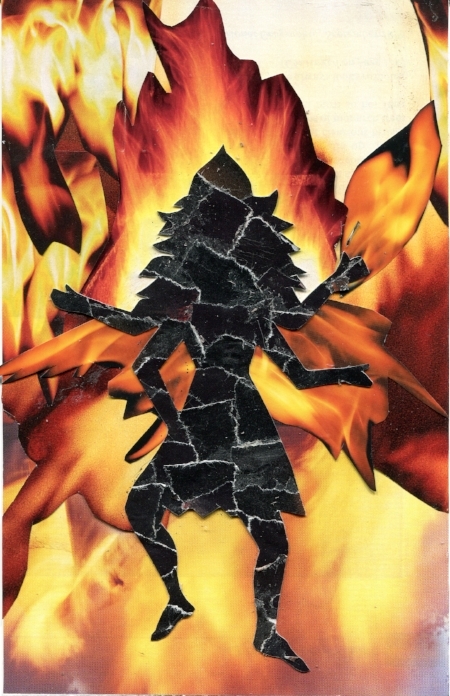 When I created the SoulCollage® card for this chakra after moving to North Carolina, I was just beginning to forge a new creative path for myself and learn how important it was for me to feed my soul and not neglect it. Little did I know when I made the card how important this image, this totem, and this energy would come to mean a year later. 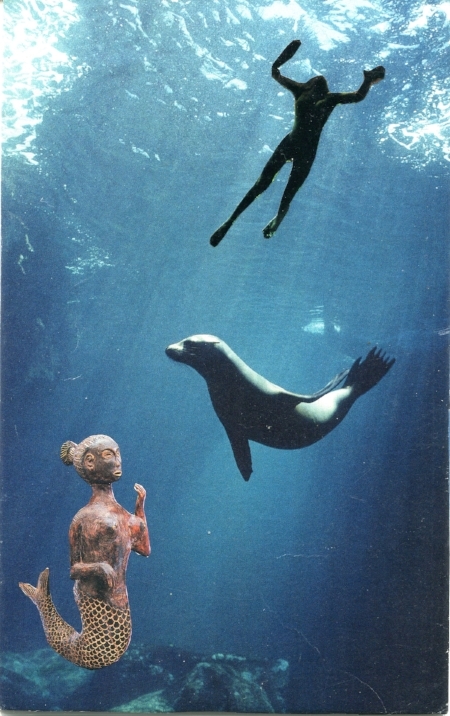 I didn't know then that the mermaid I included is symbolic of the goddess, Yemaya. 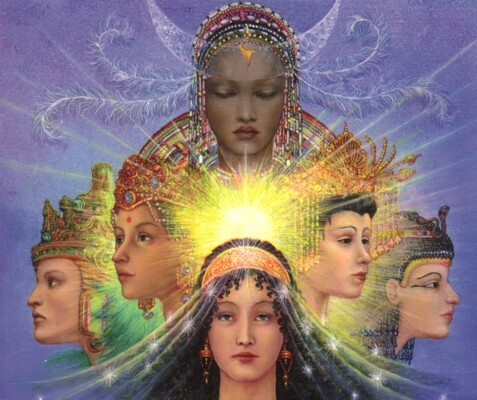 It is here that I have begun in earnest to connect with the sacred feminine in her many manifestations. 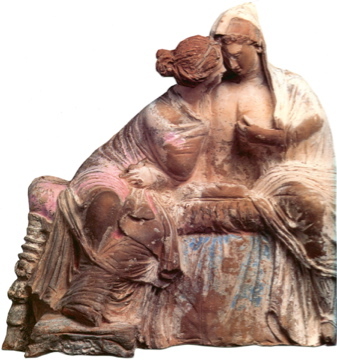 I turn to the goddesses for nurturing when I feel most alone and unsure of myself. 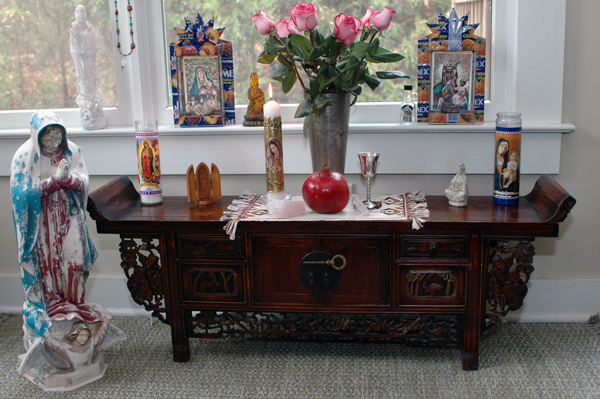 I am getting to know them better and forming relationships with them through images, rituals, and words. Just a couple of weeks ago we went to the beach for the weekend where I planned to commune more deeply with Yemaya, goddess of the Oceans and Seas -- Mama Watta, as she is known in West Africa. She is a fertility goddess who brings about birth, grants wishes, and transforms dreams into reality. I needed her help, so I put a message in a bottle and with my daughter, Chloe, we dropped it into the glistening sea.